The second edition of Learning ACT was created to pull together all the developments that have occurred over the last decade since the first edition. 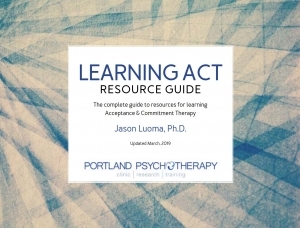 In addition to the book, you can also download a free copy of the Learning ACT Resource Guide, which is a companion to the book that provides a regularly updated list of resources to help you along your journey of learning ACT. We created the Learning ACT Resource Guide to help sort through all the books, podcasts, videos, online learning courses, exercises, and other resources that will help you learn & master ACT. This guide is meant to give you additional ideas on how to get started and how to advance your skill and knowledge of the therapy over time. It’ll connect you with resources, with ideas on how to practice and learn, and with strategies for skill development. We update this guide regularly to make sure it has an updated list of the best resources in print and on the web. The guide is best read as a pdf document as it includes lots of clickable links to get you to other resources.